4 LIC India Login – Forgot User Name? LIC Login page is the first and foremost thing to avail any online service provided by the Life Insurance Corporation of India. The LIC’s e-Services provide you with on-demand service within a few clicks. Hence, the individuals can now have many of the functionalities that were available only at a branch office, online at their fingertips. One can avail these e-services offered by LIC India if they have a policy on his/ her life or the life of his/ her minor children. With the LIC Customer login portal, the insured can check their policy status, calculate their premiums, check latest plans, etc. anytime anywhere. In the earlier days, people used to go to nearest branch offices to check the status of their registered policy or to pay the premium amount which was a time taking process. But with the development in technology, LIC India has introduced online services to their valuable customers at free of charge. Policyholders of Life Insurance Corporation of India will be searching for how to check their LIC Policy Status in an easy way. Because everyone wants to do their tasks in shortcuts. The LIC Online Login is the easiest method and also saves your valuable time and money. But most of the people don’t know about this Online LIC Login process. So, for those policyholders, I have provided a step by step procedure of LIC Customer Login in the below sections. Through this LIC Login Page, any LIC Customer or LIC Agent or LIC Development Officer can Log in to LIC of India and check their policy status or pay premiums. The various plans offered by LIC India are Child Plans, Endowment Plans, Term Insurance Plans, Money Back Plans, and Pension Plans. With the LIC of India Login portal, you can check any of your policy status within few minutes. So, everyone is preferring this option to complete their work easily and quickly. But to view the LIC India Policy Status Online, customers have to register themselves in the official website of Life Insurance Corporation of India. Once you have registered to LIC of India portal through LIC Customer login, there will be no need to visit LIC Branch Office frequently. The insured should remember that the LIC Login page is same for all LIC Customers or policyholders, LIC Agents, and LIC Development Officers. There will be no such portals like LIC Customer Login or LIC Policyholder Login or LIC Agent Portal Login or LIC Merchant Login or LIC Development Officer Login page. The LIC Online Login steps for the registered users is as follows. 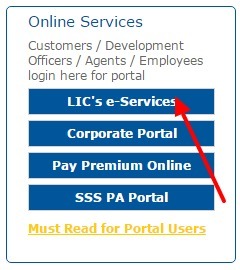 In the left side of the homepage, you will find LIC’s e-Services as shown in the below image. By clicking that, you will be directed to e-services page of LIC India with two fields namely Registered User and New User. In that click on Registered User. LIC Agents or Customers or Development Officers can login with this link. 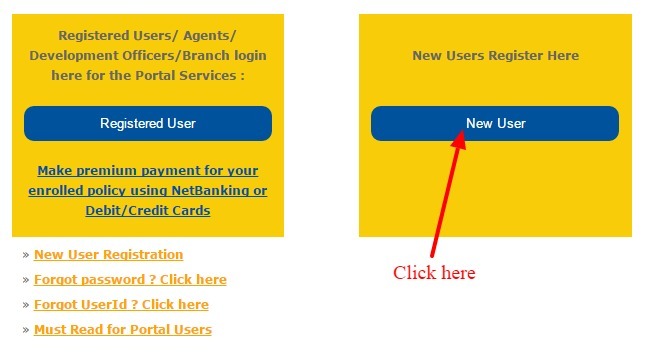 After clicking the registered user button, you will be directed to Online LIC Login page as shown below. Enter User Name, password, and answer the verification question. There on the left side of the LIC’s e-services page, you can find the Basic Services, Premier Services, and e-Services Tools provided by the LIC India. Click on the required service; if you are done then logout from the portal. LIC India Login – Forgot User Name? 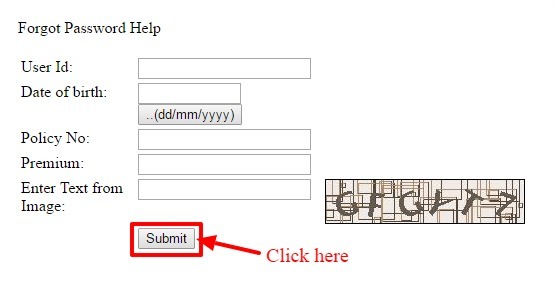 During LIC Online Login process, if you forgot your User Name, don’t worry you can retrieve your User Id by following this simple process as under. 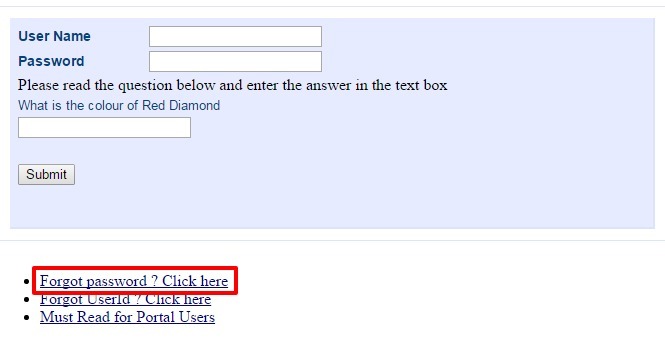 In the LIC Login for Online Services page, click on Forgot User Id option as shown below. The insured will direct to a new page, i.e., Forgot UserId Help page. In that, you should Enter Policy Number, Premium, Date of Birth details. To retrieve your User id, you must provide correct details in the relevant fields. Now you can login with your retrieved User Name easily. During LIC Customer Login process, if you forgot your Password, don’t worry you can retrieve your password by following this simple process as under. After selecting the Registered User, Click on Forgot Password option in the online services page as shown below. After clicking that option, it will direct you to the Forgot Password Help Page. 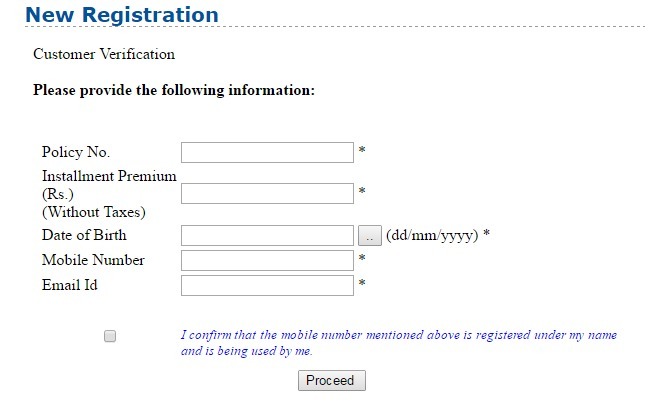 In that page, you need to enter your User ID, Date of Birth, Policy Number, Premium and the text shown in the image. To retrieve your Password, you must provide correct details in the relevant fields. Now you can login with the retrieved password and avail the LIC’s e-Services. If you are a new user to LIC India, then you should follow the below steps to get registered with Life Insurance Corporation of India. The LIC Registration steps given below will help you on how to register and avail the online services. With this LIC New Login process, one can complete their registration procedure within minutes. Visit the official website of LIC and find the online services section located at the left side of the page. In that, click on LIC’s e-services option. Since you are a new customer, you should select New User option. Now you will redirect to New Registration page. Enter details such as Policy Number, Installment Premium amount, Date of Birth, Email id, and Mobile Number correctly in the relevant fields. Finally, click on proceed button. On successful registration, you will get User Id and Password. Now, you can login with this User Id and Password in the LIC Customer Login/ LIC Merchant Login and avail all the online services.